Barely a moment goes by these days when you don’t spot someone tapping away furiously on their smartphone’s touch screen. And while they may well be in the midst of a hot-tempered email reply, the chances are they’re more likely playing an addictive-but-frustrating video game. Despite this – and with the younger generation becoming increasingly fond of motorhome holidays – it’s telling that there’s still a yearning for the more traditional forms of entertainment and relaxation. 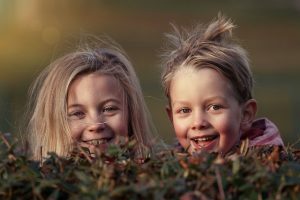 With that in mind, we thought it would be fun to list some of the timeless activities you can enjoy while on a UK holiday or things to do to keep the kids entertained whilst camping or motorhoming during a staycation. The games and activities in this post have survived decades of change and generations that are markedly different from their predecessors (which is probably far more than can be said for the fire-and-forget forms of entertainment prevalent in today’s digital society) but they remain addictive and enjoyable for all. These sorts of games can be played inside or outside in a variety of ways. Each player takes it in turn to name a topic, such as countries, boy’s names, foods, TV programmes, animals, then each player names something in that category starting with A, then B and so on. If you’re out and about you can take the concept one step further, with the first player having to physically spot something starting with A before passing to the next player to find something with B. 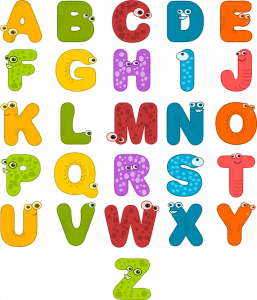 This can take a while, especially when you get to Q, X and Z so prepare to fill up a good portion of your afternoon, or morning whilst having some fun with the alphabet game if you’re out and about in an area without many obsure Q, X and Z items to spot. Still, it’s all part of the fun of this game and will keep everyone entertained. 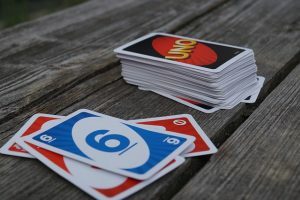 The best games come in small packages and the card game Uno is a family must-have. It’s very easy to play and requires a minimum amount of counting as it’s based on matching numbers and colours. Children over the age of 4 should manage to play without much adult help, and all that’s required to play is the deck of cards. If you’re the sort of family who wants a quick and simple game then Uno is hard to beat. All you’ll need to organise a scavenger hunt is paper and pencils, and a bit of imagination. Adults can put together a scavenger hunts for the kids based on their location, coming up with a list of items found around the campsite, beach or park. Make some easy like a leaf or pink petal from a flower, others more challenging such as an advertising flyer, or something made from red metal. Use your imagination, be creative and the lure of a small prize for the winners will keep the kids occupied for hours. All you’ll need for this game is a pack of post-it notes. Everyone writes the name of a famous person on their post-it note and then passes it to the person on their right, who sticks it on their head without looking at it. Everyone can see the name apart from the person who it’s stuck to. Players can then ask questions to try to work out who they are, as long as the question has a yes or no answer. Players keep asking questions until they get “no” in response, then it’s the next person’s turn to ask. You can also theme the game by making everyone a cartoon character, or historical figure, or a person from a specific country. 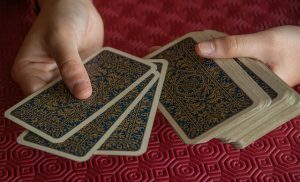 A pack of cards is a staple of any camping holiday and there are endless games which can be played by all ages. Even the smallest child can get competitive over a game of snap, and with rules for the most popular games easily accessible online, if you can’t agree on which game to play, you can easily teach yourself some new ones. Play for matches, or chocolate buttons, or come up with forfeits – loser takes out the rubbish or cooks breakfast the next morning. Another type of game which requires little equipment at all apart from a vivid imagination, there are all sorts of games about storytelling. One way of getting your imagination flowing is to get everyone to write ten random nouns on pieces of paper, fold them up and put them in the centre of the table. The first player takes a piece of paper and starts the story using their keyword. The game then progresses through the players until the story is wrapped up with the last player and the last piece of paper. We’re all familiar with the format of the World Cup, where teams play in a knock-out competition until one is left. You can do the same kind of thing with any topic, just write out 16 Harry Potter characters, or sports, or towns in the UK. Would Brighton beat Bournemouth to reach the final? Or is Ginny Weasley a better character than Luna Lovegood and why? Arguments are guaranteed, so decide beforehand how you’re going to choose the team to go through to the next stage before starting. Another popular word game is to link one word to the last letter of the first. So if for example the category was cities and the first player said Berlin, the next player would have to think of a city beginning with N and so on. The game continues until a city is repeated, or a player can’t think of an answer. The winner gets to choose the next category for the game and so on. A tennis ball or similar isn’t going to take up much space in your motorhome or tent and this also offers endless possibilities for games ranging from a basic game of catch or piggy in the middle to makeshift games of cricket or rounders. 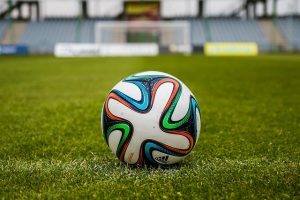 Inflatable larger balls are another good option and can be used for football and other games. Encourage the kids to come up with their own games too rather than just using the old tried and tested favourites. It’s a family classic game for a reason – it’s great fun and all ages can participate. 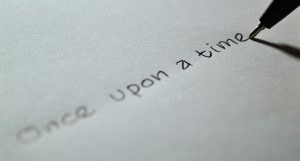 Compile an extensive list of family movies, books, musicals or songs and then take turns to act out the words. If you’re lacking in inspiration, there are apps available for smartphones which will make suggestions of titles, but the acting is up to you and the kids. Chances are, you’re going to do a fair bit of travelling when you head off on vacation, and if the car is your intended mode of transport, you’ve got the ideal tool in which to have a bit of fun. There’s the classic ‘I spy…’, but that can get rather dull (particularly if you’re spending long stretches on the motorway). The key to a great car game is to divert everyone’s attention away from the monotony of travel. 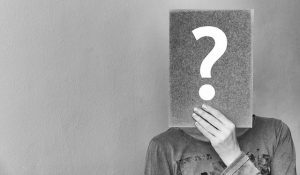 For example, try twenty questions, where one player thinks of an object and the rest have just twenty attempts between them to guess what it is. The three syllable game is also a great way to pass the time; each player has to rhythmically say a three word sentence, before passing onto the next person, who does the same, but keep some form of coherent story going. Car journeys don’t have to be boring. If you’ve never heard of this game, its origins shouldn’t take too much guessing. 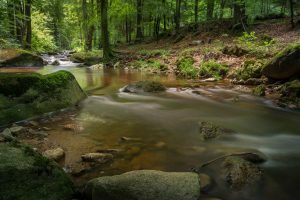 Taken from A.A. Milne’s timeless Winnie The Pooh Stories, Pooh Sticks is a devilishly simple game that requires some sticks, a flowing river and a bridge. If your holiday happens to throw up those elements, you’ve got everything you need. Here’s how it works: each player picks a stick and proceed to one side of the bridge. Everyone then drops their sticks simultaneously into the water before rushing to the other side of the bridge to see who’s emerges first. The modern day equivalent you’ve probably seen with the popular ‘Duck Races’ where the yellow plastic ducks are thrown into a stream and chased along by their sponsoring owners to see which duck wins whilst travelling down the stream. Simple, addictive and competitive – just what any holiday game should be. If truth be told, cycling is still a rather modern pastime, but the idea of going out as a family on a set of bikes is fast becoming an activity of a bygone era. Let’s put a stop to that. If you’re on holiday in the UK and don’t mind investing in a bike rack for the car, why not take your two-wheeled companions with you? 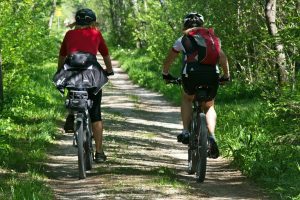 Riding together is great fun; you’ll discover far more of your surrounding area and return that little bit fitter, too. There’s something alluring about woodland. 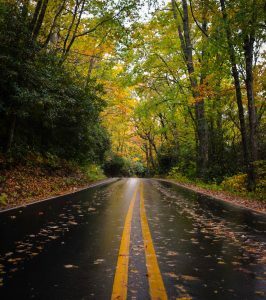 Tall trees, dark corners and seemingly untrodden paths suggest that adventure may lay ahead, so, if you tend to drive past such locations on holiday, why not stop and take a wander this time around? 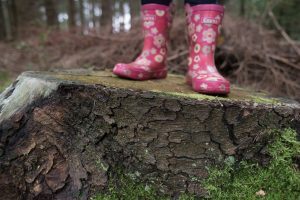 If you have kids with you, they’ll love the idea of adventuring in the woods, and if you pick a national forest or nature reserve with marked pathways, you’ll never be far from an obvious route if you venture deep into the undergrowth. Why not take a book of wild flowers along and see who can spot the most varieties and name them? If you’re camping, why not forgo the usual barbecue for something more rustic? 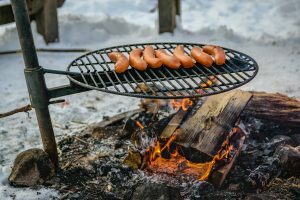 Providing you’re allowed to create fires (it pays to check with the park first), create one to keep yourselves warm, but to also provide a brilliant, open oven on which to cook the dinner (it’ll make a mean cup of tea, too). Definitely a safety first situation of course. The next time someone says they can’t live without their smartphone or tablet on holiday, point them in the direction of this list. Sometimes, having fun in the most old-fashioned of ways can be the best way to bring families together and to have a holiday that will live long in the memory. This entry was posted in Motorhome Holidays. Travelworld Motorhomes prides itself on uncompromising Customer Service and offering a complete motorhome experience.